Disclaimer: The events described below didn’t actually happen. As my funding from MIT stipulates that I heed the U.S. State Department warning, and avoid Gaza and the West Bank, what you’re about to read is not a recounting of my weekend, but rather, a fictional account of what could have happened to two MIT students who were curious about seeing life in the occupied territories first-hand. 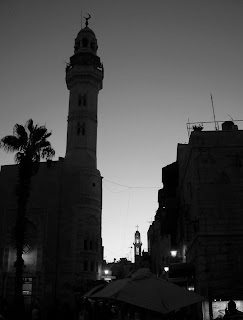 This past weekend, I went to Ramallah and Bethlehem with a friend of mine from MIT. It’s a trip I’ve been thinking about for a while – since I was in Israel last March. On that trip, sponsored by Birthright, I was presented with a pretty one-sided view of the situation here and I really felt like it was a matter of responsibility to try to even out my sources of information. Sifting though the incredibly biased media pertaining to the Israeli-Palestinian conflict is a start, but I wanted to see something first-hand. I was also shocked at how easy the traveling was. Basically, I took a bus to Beer Sheva and met my friend; we both took a bus to Jerusalem, walked to the Damascus Gate of the Old City [East Jerusalem], paid 6 shekels, and got on bus number 18, which dropped us off 15 minutes later in Ramallah. Done. Most things were closed that afternoon, since it was Friday [I still can’t get over how the three monotheistic religions have three different days of rest] so we basically just found a place to stay, wandered around the city for a while, ate some dinner, and hung out in a café, talking and observing an impromptu dance party that erupted around us. 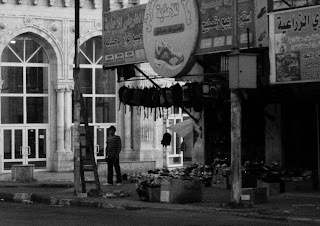 On the street in Ramallah. I don’t know exactly what I was expecting, but I was surprised. 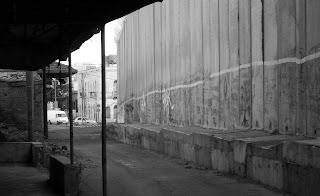 Ramallah was pretty nice, I thought…and life seemed relatively normal inside the city. I guess what surprised me the most was how ridiculously nice everyone was. Everywhere we went, people seemed genuinely excited to see, and talk to, and help out American tourists [I got the feeling that we were a bit of a rarity]. Coming from New England, it seemed…well…bizarre. We were offered rides, directions, advice on what to do, restaurant recommendations, free food, invitations to stay in people’s homes, phone numbers to call next time we were in the area, and most importantly…personal stories. I felt like more than anything else, the people that we met and talked to just wanted to tell their stories…to let us know what their lives were like, and to give us a glimpse into another perspective on the situation here. It probably didn’t hurt that we were a very eager audience. 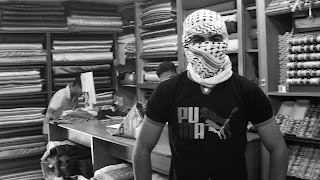 Saturday morning after eating some breakfast we ended up at the souq, where we ducked into a store with the intent of purchasing a keffiyeh [I know…I know…we sound like stereotypical left-wing Western tourists…guilty as charged.] Anyway, turns out that the guy working at the store studied political science at Marquette [which is, coincidentally, where my mom teaches.] We ended up talking with him for more than an hour about his participation in the First and Second Intifadas, the difficulties of commuting between Ramallah and his home [which takes somewhere between 10 minutes and 7 hours, depending on the unpredictable security at the checkpoint between the two locations], his take on Fatah and Hamas [he’s not a huge fan of either], his disappointment that his kids have never seen a swimming pool or a swing set, and why -- despite everything -- he’ll never leave Palestine. He gave us his number…telling us to call if we ever come back to Ramallah…that he’ll put us up and show us around. And after all of that, he wouldn’t even let us pay for the keffiyet. I didn’t then…nor do I now…know what to say about what he told us. We were advised on the "trendy" way to wear a keffiyeh. Getting from Ramallah to Bethlehem was relatively easy for us, with our U.S. passports. We took a bus back to Jerusalem [which stops at the border…you get out, walk through a security check, get back on the bus], then another bus to Beit Jalla and walked to Bethlehem. [We were advised to do it this way…in order to avoid passing through an additional checkpoint.] 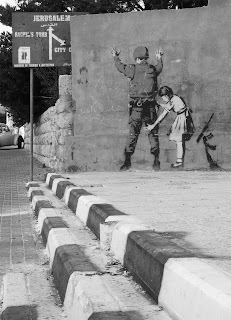 In Bethlehem, we were particularly interested to see some of Bansky’s work and also to get an up-close-and-personal view of the wall. 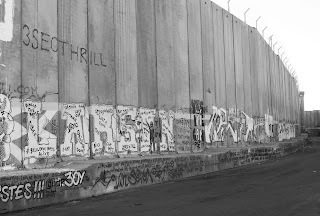 I know that this is a weird sort of tourism…it’s kindof sick, actually…to want to go somewhere in order to see such a divisive thing as the “separation barrier” / “security fence” / “apartheid wall” – even its name(s) is controversial. Anyway, on our search for political graffiti we happened to walk past the Intercontinental Hotel which is, from the outside, a beautiful stone building. Having heard about how fancy it was on the inside, we thought we’d try to go in and have a look around. What happened next was one of the most surreal travel experiences I’ve ever had. Let me say a few things first, before I continue the story. First of all, I felt like we’d done our homework before going to the West Bank. I heard that it could be dangerous and so I’d been reading the news quite carefully for a few weeks before hand – looking for any sign of protests or other potentially dangerous situations. In general, things seemed relatively stable; the only potentially questionable thing over the weekend was, of course, the Fatah congress meeting. Now, I knew that the meeting had been extended…that it was going on in Bethlehem while we were there. What I didn’t know was exactly where. Second, we did notice that as we were walking down the street towards the hotel there did seem to be an awful lot of security…I mean a lot of security…even by Middle East standards. But we’d never been in the West Bank before and had nothing to compare it to. Given the standard level of security in Israel [think American airport, but with a lot more military and bigger guns…everywhere, all the time] it seemed entirely possible that in Bethlehem, a city under military occupation, it might be normal for there to be soldiers with AK-47s, police, and private bodyguards…everywhere. 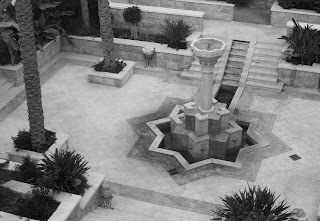 Gardens at the Intercontinental Hotel, Bethlehem. Right-O…the Fatah congress…here…in this room…right now. WHAT?! Our tour guide apologized profusely as he excused himself. He said he would have loved to show us around some more, but it was a very busy day at the Intercontinental. We continued to walk around for a while on our own…wondering to ourselves whether this historical event -- that we were somehow accidentally in the middle of -- was more like a political party national convention or a meeting of mafia bosses. Either way, we decided, it was more exciting than a lot of things we could be doing on a Saturday afternoon. We also, after some time, decided that if anything scary were going to happen in the West Bank over that particular weekend, it was definitely going to happen right there…in the lobby of the Intercontinental. On that note we decided to conclude our hotel tour and continue our search for Bansky. After seeing the wall and some graffiti, we decided that since we were in Bethlehem…we should probably go check out the Nativity church -- you know, the one where Jesus was born. We hailed a taxi and the driver, Ishmael, dropped us off at a check point a few blocks away from Manger Square [yes, it’s really called Manger Square.] We walked up hill and into the plaza in front of the church. Never in my life have I seen so much security – Palestinian Authority soldiers, military police, regular cops, non-uniformed security guards, snipers on the roofs of the surrounding buildings…plus press vans with satellite dishes, camera crews, and broadcasters…everywhere. My friend and I were with it enough to figure that something was probably going on, but we were a little confused…I mean, we’d just come from the Fatah congress meeting – the big gig in town. What could all of this commotion be about? Cool. We quickly recalculated…turns out if something was going to get out of hand it in the West Bank this weekend the most likely spot wouldn’t be the Intercontinental Hotel afterall…it would be Manger Square. Looking up from Manger Square. Well, we debated for a moment what to do next. Get back to Jerusalem before dark? Go home? And then, we decided what the hell, we’d have a cup of tea at the Bethlehem Center for Peace. Might as well…we were already there. Tea with na-na [mint] it was, and we spent the next hour or so sitting amongst Fatah’s young guard, compiling our collective knowledge of Fatah, Arafat, Hamas, and the congress proceedings, wishing we had access to the internet [where was the iphone when you needed it?] and wondering how we could have possibly ended up somewhere we so didn’t belong. 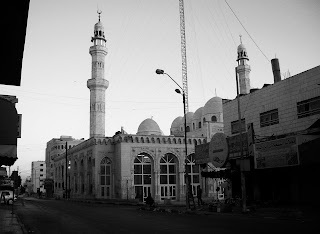 In a moment of brazenness, we decided our current location afforded us such a unique opportunity to learn about Fatah, that we couldn’t possibly pass it up. We had to talk to someone. There was, at the next table over, a guy who had been sortof trying to get my attention [okay, so there are some perks to being female] and so we figured he was a good candidate [we couldn’t have been more right]. He turned out to be a documentary film-maker who was at the convention interviewing people for a new project. He gave us a overview of his take on the history of Fatah, the “universal” popularity of Arafat, the source of conflict between Fatah and Hamas [Fatah’s willingness to recognize and negotiate with Israel], the problems with Hamas in Gaza [they can’t deliver the social improvements they promised because nearly all of Gaza’s resources have been cut off -- European and American governments won’t give foreign aid to “terrorists”], the elections that were in progress upstairs, and the future of the party that was being debated before our very eyes. So, we called up Ishmael [our cab driver from earlier on] and he said he’d come pick us up at the check point. He arrived shortly after [leaving us a few minutes to chit chat with the soldiers] and drove us to the border, where we were herded through a dizzying series of steel walkways, metal detectors, and one-way gates. Luckily, flashing our American passports eased the process and before too long we were back in Israel, in another cab, heading for Jerusalem’s central bus station. 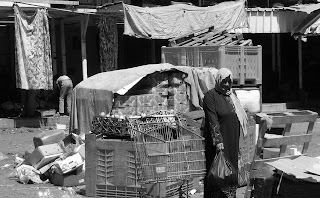 For a few more photos from the West Bank, click here. Since I got back, I've been trying to read up on the conference, to try to figure out exactly what was going on there. This video clip gave, i thought, some pretty good background info on the party. All in all, the New York Times seems pretty optimistic about the situation [see here]; not surprisingly, the Israeli media is less so [see here].